Do we need robot weeders? The about-to-be unleashed Tertill starring in its own promotional video. Do you want one for your garden? Massachusetts-based Franklin Robotics, developers of the infamous Roomba Robot Vacuum [Editor’s note: In case you don’t know what a Roomba looks like, check out this video: Cat In A Shark Costume Chases A Duck While Riding A Roomba] is seeking financial aid on Kickstarter for their latest invention–a solar-powered weeding robot dubbed Tertill. 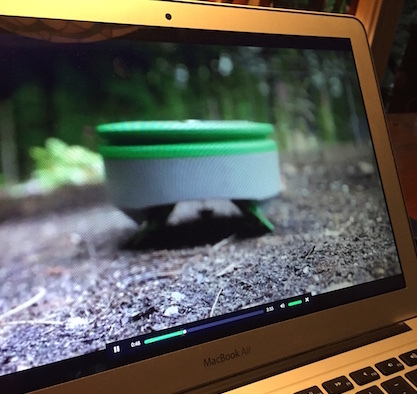 The small, bright green, bluetooth-enabled weed-eating machine is designed to roam the earth (well, actually your small patch of paradise) disposing of unwanted plants with its built-in, teeny, tiny weed whacker. How cute is it? Undeniably cute as you can see for yourself–the video, below, captures the little guy in action. But does the world need a small robotic garden weeder? Let’s weigh the pros and cons, shall we? Tertill eliminates the need for herbicides. You never need to charge or replace its batteries. It weeds your garden every day, even when you can’t or won’t. Robotic awesomeness aside, I feel a need to point out the one big fact that doesn’t seem to be an issue to anyone involved in the making or promotion of Tertill. The machine doesn’t have a micro database onboard for identifying weeds. No, it decides whether to whack a plant or not based solely on the plant’s height. The rationale goes that plants you want are tall and plants that are weeds are short. Seriously. Small wire barriers are provided with your Tertill that act as little fences so you can protect young, wanted plants from being whacked by mistake. So if you’re just putting in a new garden from seed, good luck with that. By the way, one of the helpful notes about using your Tertill includes “Make sure there’s enough room between the plants for Tertill to get to all the weeds”. Those gardeners who love a lush garden crowded with plants: Please feel free to leave the room at any time. Battling weeds, space and costumed Chihuahuas. In Franklin CTO Joe Jones’ blog posting ‘The Roboticist and The Garden’, he writes about some of the inspiration behind Tertill which involved his own challenges with battling weeds in his vegetable garden. Now, I grant you that most vegetable gardens are designed with plants in neat rows and not much but naked earth between each row and each plant. So I can see how setting loose a robot in a vegetable patch kinda might make sense to some gardeners, although anyone following the basics of permaculture would be apoplectic over the idea of keeping the soil around their veggie plants bare of any kind of green mulch much less companion plants. I just can’t get my head wrapped around the idea of having to protect every young/short desired plant in a vegetable garden. Or leaving the ground smooth enough for wee Tertill to get around. But I really can’t see Tertill being used in a flower garden. Not even the neatest, tidiest-ever flower garden. The whole point of a flower garden is to have the garden fill in with blooming exuberance. Leaving space between each plant rankles my aesthetic sensibilities. And what if the neighbour’s chihuahua, all dressed up in his custom-made Spiderman suit, decides to take it for a spin? Well, actually that might be worth the price of a spacey garden. But – weeding is more than half of what I do in the garden, and so very satisfying. I’d rather have a robot for the things I really don’t like doing. LOL! I wonder why a robot hasn’t been invented to clean the bathroom! It’s a weird concept.. may work in the French style garden where everything is quite far away from each other but not in the English style gardens!! I agree! At first I thought they’d invented it without having any gardening experience so I was a little surprised to find that the one fellow had been vegetable gardening for some time. Neat gardens with lots of space between plants and the soil either left bare or covered in a fine mulch seems to be the only kind of garden that Tertill would be happy in! I suppose they’ve already thought about the inconvenient fact that while floors are smooth, ground tends to be bumpy and uneven? True! I understand that they designed Tertill with angled wheels to help it negotiate lumpy soil but to me it looks like one small pile of leaves and twigs would have it spinning it’s wheels pretty quickly. This would definitely not work in my garden, but maybe it would for those mulch island gardens with odd very manicured shrub or day lily? I don’t love weeding, but I have to say there is something pleasing for me about perusing my plants and getting my hands dirty. It’s when I am weeding that I notice emerging plants, interesting insects and the life all about my garden. I wonder if this is a noisy machine? I hope not, as there are enough weed wacking, leaf blowing noises about as it is. I completely agree about getting your hands dirty. Weeding, to me, feels almost meditative and it’s part of a much larger communion with the garden. When I was writing this post I didn’t think about what kind of noise Tertill might make. Good point!